After a heated discussion at Tuesday's Council Meeting, the next stop for many taxpayers will be on Monday, August 25th for the Galloway Township School Board Meeting. The meeting will take place at 7 p.m. at the Middle School located at 101 S. Reeds Road. Resident's planned a protest at the August 19th Council meeting which exceeded the Township's meeting room capacity, leaving many to wait outside and not have a chance for their voice to be heard. Mayor Don Purdy, who received notice of the planned protest on August 1st by Galloway Township News, told residents that showed at the meeting he didn't know or plan for the crowd that showed. Purdy stated a workshop meeting would be held at a different location in order to meet the demand of residents that wanted to speak, a meeting date has yet to be released by the Township. 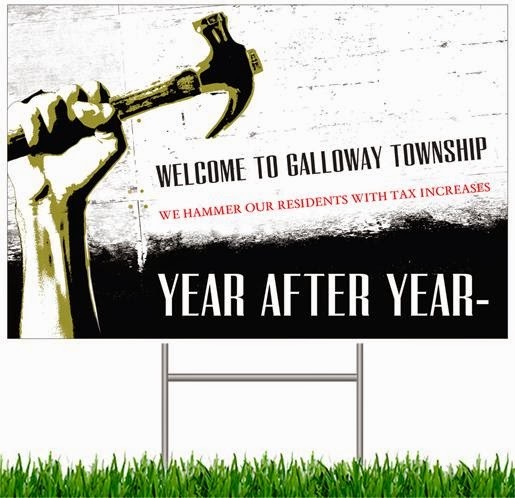 Purdy encouraged residents to voice their concerns over the property tax increase that went into effect at the Galloway Township school board meeting. Purdy stated he would attend the School Board meeting. “I am asking the town manager to double check the home values and the numbers because something doesn’t seem right,” Purdy said. “I will bring this up at the Council meeting (Aug. 19) because I want to waive the penalties and interest for homeowners who are late on their taxes.” Council did not vote to waive any fees. “I am asking the town manager to double check the home values and the numbers because something doesn’t seem right,” Purdy said. The home values are for the most part where they need to be now and he knows this already. The re-assessment was required so they could jack up the tax rate to the current rate. Sure, the school tax is high BUT the REAL issue here is the tax rate. Demand that the tax rate be lowered and don't let the Dirty Purdy Piney Politics cloud the issue. The tax rate MUST be lowered. I thought the tax rate was determined by the amount of money required by a combination of county, municipal, district school, and regional school budgets. This in conjunction with the towns total valuation determines the tax rate. You just can't lower the tax rate as you see fit.